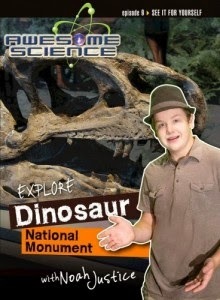 We absolutely love the Awesome Science series in this house, so we were thrilled to get the chance to review Explore Dinosaur National Monument with Noah Justice. One thing that is simply fabulous about this series is Noah Justice, the teen guide for these videos. He is entertaining and informative, and since he is in the same age range as my boys, he doesn't intimidate any of my kids. New titles that are out right now also includes Explore the Mammoth Site with Noah Justice. Yeah. We're getting it. But back to this DVD. This video focuses on the huge dinosaur find in western Colorado and eastern Utah. Obviously, dinosaurs are the main focus of this DVD, answering questions about what kinds of dinosaurs are found, and what rock layers are they in. The Awesome Science DVDs so far have focused mostly on geology, and clearly this one addresses geology as well. But there is also a fair amount of biology as the dinosaurs are discussed. Normally, before I review an Awesome Science DVD, we watch it three to four times. Since we've been out of town most of the month for my mother's funeral, we only watched this once so far. That means I'm not giving as many details as I'd like. Like all of the other videos in this series, the footage is fantastic. Noah packs a lot of information into these 30 minute videos. And you absolutely have to watch the bloopers. Go see what other Moms of Master Books have to say about Awesome Science: Explore Dinosaur National Monument. There is a Facebook party coming up on Monday, March 30 at 7:00 pm Central Time, where you could win cool prizes -- and discuss the DVD too. Disclaimer: I received this DVD for free from New Leaf Publishing Group as part of the Moms of Master Books program. No other compensation was received. The fact that I received complimentary products does not guarantee a favorable review.